quick knit for your summer getaways! 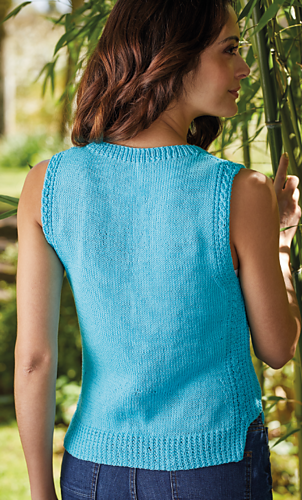 Summer knits are all about lightweight yarns, breathable stitches and stylish patterns – this trendy top ticks all the boxes! Sarah’s used a fancy moss st rib for the bottom that doesn’t pull in and added just a touch of shaping up the sides, to give the garment a fitted look. 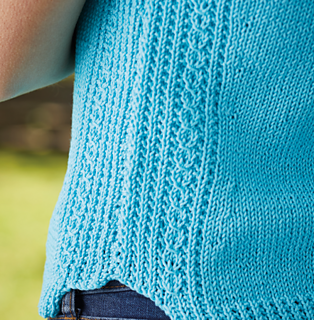 She’s also created faux cables using simple slip stitches along the sides. We’re loving this vibrant bright blue shade, but you can take your pick from more than 24 bright, rich colours.